Over 11,000 renewal applications were received during the 2017 renewal period with over 95% of those received by 31 December. This figure includes 680 teachers who transitioned from provisional to full registration – congratulations! Our busiest period was October, when 521 applications were received in one day and 2,068 applications were received in one week. You can look at all of the registration statistics on our website here. The Office of the eSafety Commissioner has online safety resources for schools, parents and communities as well as multimedia and lesson plan resources for primary and secondary school educators. Find our more here. The Hartley Institute is holding Integrating Coding and the loT across the Curriculum. A four-session program providing teachers the opportunity to learn how to take students on a coding journey that enhances explorations in multiple subject disciplines. From Monday 7 May – Monday 18 June, 4:30pm – 6:30pm, the Hartley Institute, cnr Capper Street & The Parade, Kent Town. Cost $550. For more information click here. Empowering Educators in Experiential Learning is a professional development session that discovers alternative pivots for STEM thinking and problem solving by using works of art, objects and living things to foster engagement through inquiry based learning. This seminar will involve participants engaging with the Adelaide Botanic Garden, the Art Gallery of South Australia and the South Australian Museum. Friday 11 May, 9am-4:30pm at the Art Gallery of SA. Cost $95 educators, $60 pre-service educators. To find out more or to book click here. Understanding the Autism Spectrum for anyone who lives or works with an individual on the autism spectrum. Wednesday 2 May, 9:30am – 12:30pm, members $85, non-members $90. Strategies to Support Individuals on the Spectrum where participants learn how to use a range of social, communication, behavioural and sensory strategies to support individuals on the spectrum. Wednesday 2 May, 1:00pm – 4:00pm, members $85, non-members $90. Both workshops are being held at Autism SA, 262 Marion Road, Netley. Find out more information here. 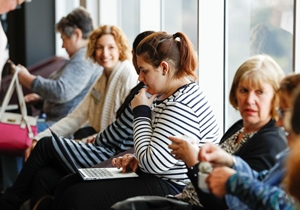 The Geography Teachers’ Association Annual Conference is being held on Thursday 24 and Friday 25 May at the Education Development Centre, Hindmarsh. High school teachers (member) $140-$200 & non-member $190-$300, primary teachers $70-$90 and pre-service teachers/non-school based teachers $70-$90. Email for more information admin@gtasa.asn.au. The Entrepreneurship, Commercialisation and Innovation Centre at the University of Adelaide is holding An Introduction to Prototyping and Teaching with 3D Printing and Design two-day workshop. Monday 16 & Tuesday 17 April, 9:00am-5:00pm at the University of Adelaide, Nexus Building, Cnr Pulteney Street and North Terrace. Cost: $300 + booking fee. To register or find out more information click here. The Art Gallery of SA is holding Educators Connect: Colours of Impressionism on Friday 4 May at 4:30pm -7:00pm at the Art Gallery, North Terrace, Adelaide. Cost $22. To find out more or to book click here or email learning@artgallerysa.gov.au. Street Art & Aerosol Painting with James Dodd, Monday 16 April, 10:00am – 4:00pm. At Adelaide Central School of Art, 7 Mulberry Road Glenside. Cost: $40 members, $80 non-members + booking fee. Teaching & Assessing the Creative Process, Tuesday 17 April, 10:00am-3:30pm. At the Art Gallery of South Australia, North Terrace, Adelaide. Cost: $40 members, $80 non-members + booking fee. The 2018 South Australian Health and Physical Education Conference is being held on Monday 16 and Tuesday 17 April at Rostrevor College. To see the program click here. The Migration Museum is holding Wandering Wednesdays – Teacher Open Night on Wednesday 4 April, 4.30pm – 6:00pm. Wander around the museum and explore the education programs while learning how to integrate an education visit to the museum into your curriculum plan. Meet with the Museum Officers, Curators and Education Manager. Parking available upon request. Cost: free and a certificate of attendance is provided. Please RSVP mbendo@history.sa.gov.au. How Language Works: success in literacy and learning, with Bronwyn Custance. This is a comprehensive professional development program for educators seeking to extend their understandings about language and literacy. It is most relevant for teachers of years 3-12. The completion certificate includes 30 hours of face to face learning (10 modules x 3hrs) with additional hours spent between module activities and responding to readings. The evening course (10 modules) will be held 4:00pm-7:00pm, starting on Wednesday 2 May. Click here for all of the dates and more information. The intensive course (six modules) will begin on Monday 16 July 9:00am-3:30pm. Click here for all of the dates and more information. The cost of $750 must be paid prior to the first module. Both courses are being held at the Education Development Centre, Hindmarsh. Understanding Autism Spectrum Disorder (ASD), Monday 16th April, 9.30am-4.30pm at Novita, 171 Days Road Regency Park. Cost: $250.00 per person (+ GST and booking fee). How to use a PODD, Wednesday 18th April, 9.30am-12.30pm at Novita, 171 Days Road Regency Park. Cost: $125.00 per person (+ GST and booking fee). PODD Practice, Thursday 19 April, 10am-12pm, Novita, 15-31 Ayliffes Road St Mary’s. Cost: $97.00 per person (+ GST and booking fee). Exploring Behaviour, Wednesday 18th April, 1.30-4.30pm at Novita, 171 Days Road Regency Park. Cost: $145.00 per person (+ GST and booking fee). Understanding Sensory Processing, Monday 23rd April, 9.30am-12.30pm at Novita, 171 Days Road Regency Park. Cost: $145.00 per person (+ GST and booking fee). Using Visual Strategies to Support Children’s Learning, Monday 23rd April, 1.30-4.30pm, Novita – 171 Days Road Regency Park. Cost: $145.00 per person (+ GST and booking fee). Developing Emotional Regulation Skills in Individuals with Anxious, Oppositional and Aggressive Behaviours on Wednesday 16th of May, 9:00am-3:00pm, cost $220.33. Australian Education Union, 163 Greenhill Road, Parkside For more information click here. Assessing, Preventing and Managing Challenging Behaviours on Thursday 17th of May, 9:00am-3:00pm, cost $220.33. Australian Education Union, 163 Greenhill Road, Parkside. For more information click here. Teaching students affected by Trauma on Thursday 17th of May, 3:30pm-7:00pm, cost $132.30. Sage Hotel 208 South Terrace, Adelaide. For more information click here. Copyright © 2018 Teachers Registration Board of South Australia.